"You pesky little critter I thought you were cute now you're just a little pain in our boot. You pesky little critters turning things upside down, you're messing up our friendly little town." So this song from Sheriff Callie is the first thing that I thought of when I hear the word rat. (This is what happens when kids take over the television. LOL!) Though personally I don't find rats really cute. They look scary especially the big ones, they nibble on foods, nip on clothes and other stuff and they are filthy. What's even more scary is that they carry health threatening diseases, such as leptospirosis which is prevalent during rainy seasons. And boy am I glad that we don't have to deal with this pesky little critters here in the condo, well none that I know of. However, it's the opposite in Jaear's family house in Manila. That's why when I was given a box full of Pest Off! Rat Control products I knew it would be in good use. Pest Off! is a brand owned by Global Winds Corporation, a duly registered company with the Food and Drug Administration as a Household /Urban Hazardous Substance Distributor/Importer/Wholesaler. Pest Off! carries a wide variety of extensive insect and rat control products that has every family's well-being in mind. Pest Off! sent me their 2 Rat control product line; the Ready to Use Cereal Bait and the Glue Boards. Pest Off! Ready-to-Use Cereal Bait contains 2nd generation anticoagulant compound, Brodifacoum. Anticoagulants prevent blood clotting that leads to internal haemorrhaging and eventually to death of the rodent. Effective- Since it contains 2nd generation anticoagulant, it effectively and efficiently eliminates rats and mice in just a single feeding. Affordable- It's affordable compared to other brands. Other brands also contain 1st generation anticoagulants Warfarin & Coumatetralyl which requires multiple doses so Pest Off! lasts longer. Cereal baits are poisonous and by far the least humane way to deal with rats. It sure is effective but it doesn't take effect instantly, rats still get the chance to run and hide so you still have to hunt for the dead stinking rat. Pest Off! Glue Boards on the other hand are the ultimate and modern rat and mice catching traps. It contains super adhesive and non-toxic glue that catches pesky rodents. Considering that rats vary from house hold to house hold, Pest Off! provides consumers with 8 varieties of Pest-Off Glue Boards fit for the consumer's problems and needs. Pest-Off! Glue Boards' super adhesive glue practically looks like "water in a shallow container". Because according to studies, rat's main important consumption is water; they need ½ to 1 ounce of water as it cannot survive long without it. So this design somehow lures the rats and mice to drink they eventually get trapped and die. We are currently here in Manila for the wake of Jaear's grandmother who just died last Friday (a very sad event) so we got to test all the glue boards as well. Convenient- It's easy to use, just place them on the usual travel routes of mice and rats. Disposal is also hassle free, just place the board together with the rat and place in a tightly tied plastic bag. Effective- As long as it's placed on the usual routes, rats will get trapped on the super adhesive glue. Rats can be seen dead right on their tracks therefore, no need to look for stinking and rotting rats all over the house. Safe- The adhesive glue is non toxic so it's safe for everyone. In case a body part gets in contact with the adhesive, simply wipe away with baby oil or mineral oil and then wash with water and soap. Affordable- Compared to other brands, Pest Off! is more affordable with more varieties to choose from. I actually couldn't think of anything that I'd like to change about the glue boards, I like everything about it and I highly recommend it to everyone. Just in time for the rainy season wherein flooding is highly anticipated, together with it comes a dreaded disease, leptospirosis and over 70 other health threatening diseases and serious infections. So it's really important to clean our house and get rid of those pesky critters. 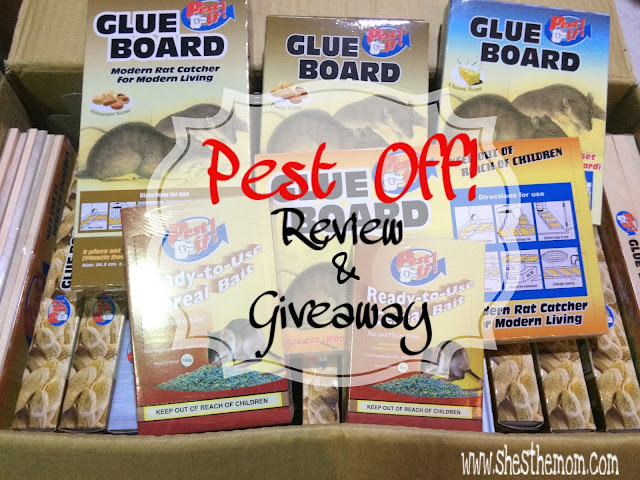 And to help you with that, I am giving away 2 Pest Off! Rat Control product line worth Php1,000 each to 2 lucky readers! P.S. I'll verify each entries at the end of the giveaway period so please make sure to follow mandatory steps to qualify. Thank you for your usual support!